For the second game of the day we would be facing team Portugal. These guys are actually very active players in France (but half of them are of Portuguese origin, hence the name). Last year we had the pleasure of facing them at the first Benelux Cup, which they won, and at LBM where we took our revenge and beat them! This time they had lined up five very competitive lists, and I got to play @Paulo with his Daemonic Legions. So overall a list centered around four big blocks, all reasonably fast thanks to the army-wide swiftstride of the DL, plus a scouting Courtesan and some flying redirectors. The deployment this time was Counterthrust and the secondary objective King of the Hill. My opponent won the roll for sides, and declared the Water feature as his piece of terrain for the secondary, while I picked the hill to the left. His Omen picked Hand of Heaven, Smite the Unbeliever, Cleansing Fire and the DL Hereditary, while the Courtesan picked Raven’s Wing and the DL Hereditary. I took the same spells I’d end up taking all weekend long: Breath of Corruption/Grave Calls and Ice and Fire/Crippling Fatigue. 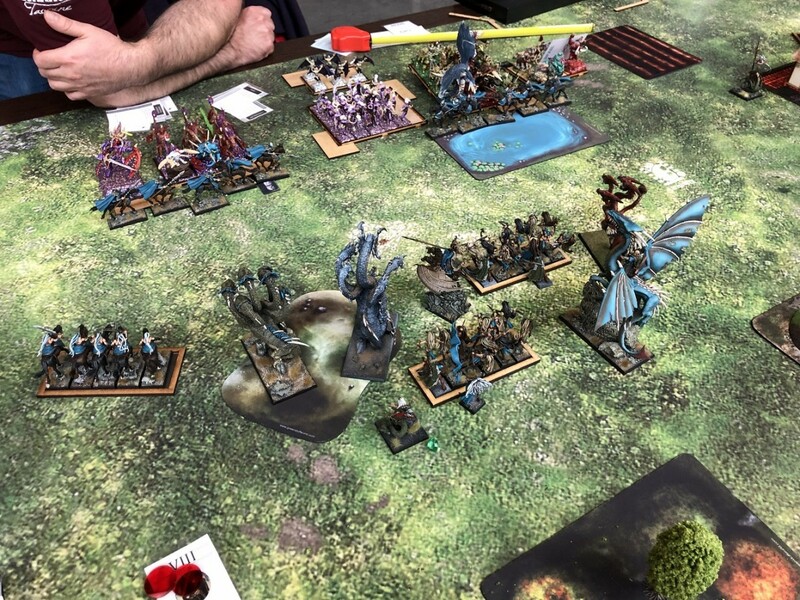 Knowing that I’d get a considerable bonus for the first turn, and also that we’d be fighting for control of the western part of the board, I used my Dark Raiders to push the daemons back in deployment, and then dropped for first turn. As expected, the daemons deployed right across from my army. In the magic phase the Breath of Corruption was cast and resulted in a single wound on the Courtesan. The Grave Calls was dispelled, and the Ice and Fire dealt a single wound to the hoarders. My opponent surprised me by opting not to charge the dark raider screens! This was a good call, as it would be chaffing me up as much as it did him. The units shuffled a bit, the Succubi moved back but generally the rest held their ground and the Omen joined the Lemures. Magic started with a Hand of Heaven on the nearest kraken failing to wound, then a casting of the Hereditary spell on the manticore was dispelled. A second attempt at the Kraken on the hill resulted in two wounds. Finally, the Raven’s Wing was dispelled. In the shooting phase the Harvester took aim at the Blades of Nabh closest to the Lemures, and managed a massive 28 hits! Thankfully, the to-hit penalties from range and cover were enough to limit the damage: the salvo only resulted in two dead witches! I feared that the Blades wouldn’t survive a second volley from the Harvester, I declared some charges: First, the rightmost Dark Raiders had to get out of the way. 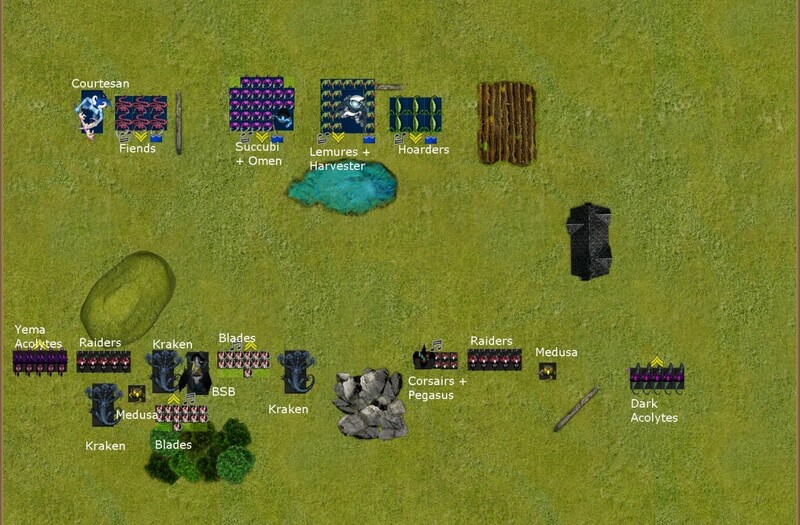 So they charged the Fiends’ flank, opening the way for my rightmost Kraken and the nearby Blades to charge the Lemures. 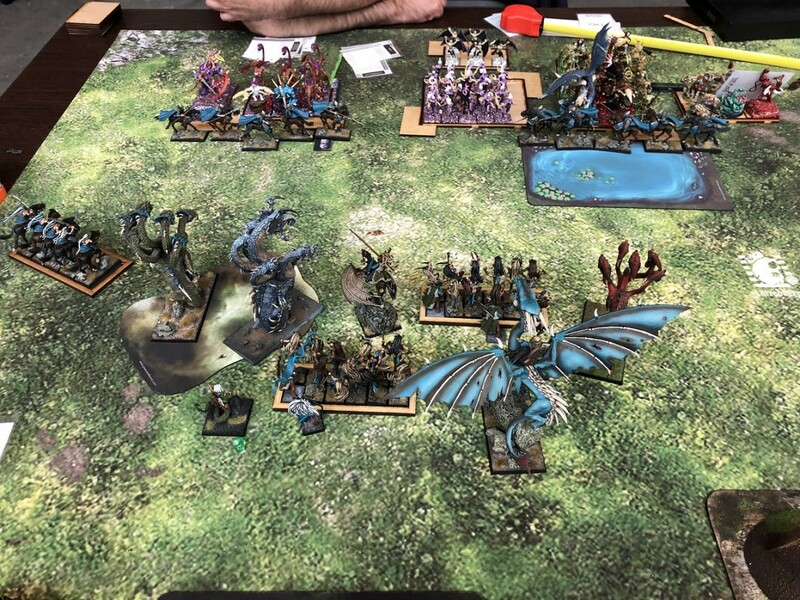 The Pegasus Prince and the wounded kraken spotted the Furies right in front of them and charged them: the Kraken had a 9+ overrun into the succubi. Finally, the Blades right behind the kraken also declared a long charge into the furies: if they made it in, they would use that combat as a stepping stone to get into the Fiends right behind. All of the chargers made it in except for the long Blade Charge. 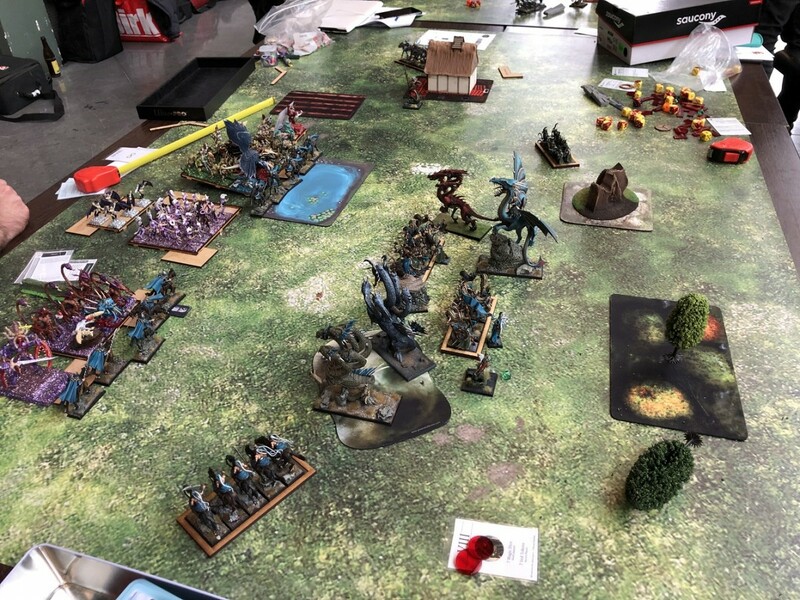 The second unit of Dark Raiders continued to block the Courtesan, and the Medusa to the right moved up to redirect the Hoarders away from the Lemure combat.The two acolyte units were now staring at the Daemon flanks. In magic I managed to cast Crippling Fatigue on the Lemure block on a high roll, which my opponent had to let through. He then dispelled the Grave Calls against the Courtesan, and the Breath of Corruption was cast but I totally forgot to use it! 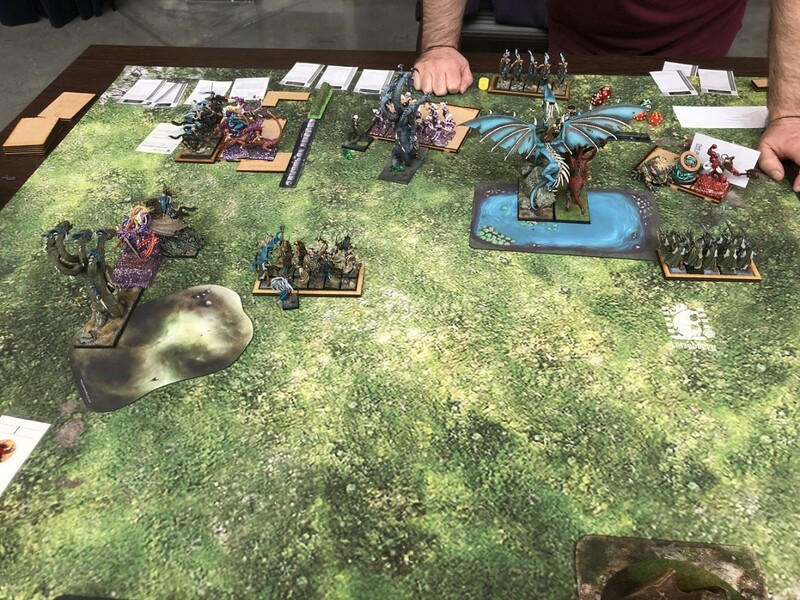 We started combat with the Omen/Lemure/Kraken/Blade fight: The blades went berserk against the Omen and dealt 6 wounds, instantly killing the Greater Daemon! The rest of their attacks were directed at the Harvester, but that proved to be a mistake since I couldn’t pierce its armour. The Kraken attacked the Hope Harvester too, but a series of 5+ aegis meant that no damage was dealt to the machine. The daemons retaliated and killed 6 Blades, but the added combat resolution from the Stomp kept both units in combat. The Pegasus and Kraken killed the furies but the kraken fell one inch short of the succubi. Finally, the charging Dark Raiders exchanged a wound with the Fiends and held their ground in a tied combat. 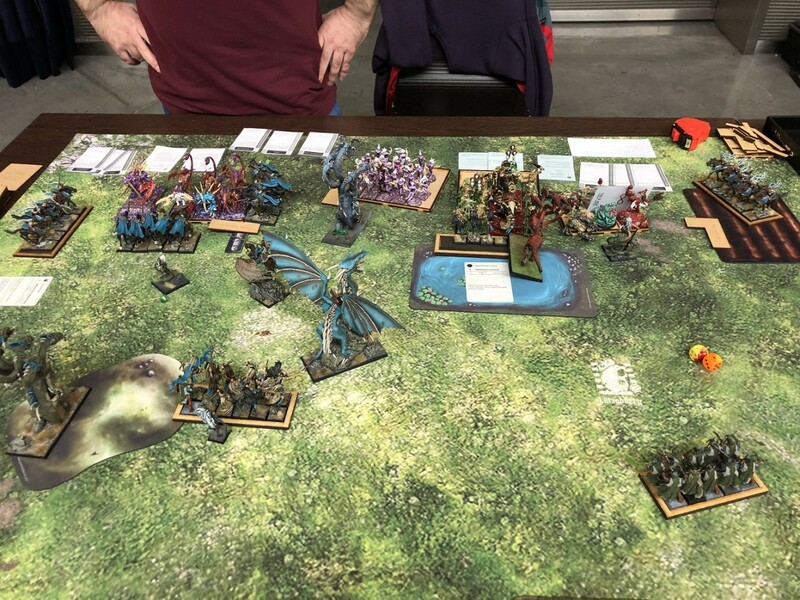 With the main caster dead on turn 2, the daemons now had to claw back some points: the Courtesan charged into the Dark Raiders and the Hoarders fell upon the blocking medusa. Finally, the Succubi charged into the kraken right in front of them. With no useful magic and no shooting, we went straight to combat. The Courtesan forced the Dark Raiders to flee and cut them down in pursuit, but failed to roll the 10+ needed to exit my general’s Arc of Sight. The Succubi started a long fight against the wounded Kraken: they were unable to pierce its tough skin, and in return suffered some casualties back but held their ground. The Fiends fluffed their attacks and got hold into place by the flanking dark raiders again. In the big fight the Kraken dealt 3 wounds on the Hope Harvester and stomped a could of Lemures. The Blades died to an elf, but also took some Lemures with them. The daemons failed their unstable test and took another couple of casualties. Finally, the Hoarders failed to kill the Medusa and took two wounds back; the fight carried on after the Medusa passed its break test. The countercharge was sounded: the Prince flanked the Courtesan, the Kraken falling into the front of the daemon. The yema acolytes charged into the flank of the fiends and the Manticore charged into the Lemures. The second medusa charged into the succubi fight. The remaining blades also attempted to charge the fiends but failed their charge. In magic the Crippling Fatigue was stopped, leaving me the possibility for a Breath of Corruption on the Yema Acolytes. The Courtesan challenged the Prince to a duel: the daemon suffered 3 wounds for none back, and had to pass a very shaky Ld 4 test. He held and the fight went on. The Hoarders dealt with the Medusa and turned to threaten my kraken’s flank. The Succubi once more failed to wound the Kraken despite rolling buckets of dice. The Yema acolytes killed two Fiends with their attacks and dodged the attacks back. The Dark Raiders were less fortunate and died to an elf. The Fiends reformed to bring more models in the fight now. Lastly, the Manticore/Lemure fight resulted in a dead Lemure unit and the Hope Harvester still clinging to its last wound, pinning my units long enough for the impending Hoarder charge. The hoarders flanked my Kraken: this fight went my way, the Kraken managing to kill a hoarder and the Manticore finishing off the Hope Harvester. The Kraken against the Succubi continued to impress and dodged all of the daemonic attacks. The daemons suffered enough casualties to cause them to pop. The Fiends vs Acolytes combat also went well, with the Acolyte Champion using his Breath Weapon to tip the combat this turn. Only one fiend remained, and it died to combat resolution. Finally, the Courtesan died to my Prince’s Attacks before getting to strike back. From this point onward and until the end of the game it was a matter of time before the rest of the daemonicforces were dealt with: the acolytes to the right aided the Kraken against the hoarders, staying in the fight long enough for the Prince and the remaining two krakens to pile into the fight and kill all of the Hoarders. With all of the daemonic units wiped out, this ended up being a 20-0 victory for the Dread Elves. Clearly this game went 100% according to plan, and the impressive result was definitely aided by my opponent’s bad dice rolling in his first turn. His choice to ignore my Dark Raider screens backfired when he gave the rightmost unit a charge possibility to get out of the way. Suddenly his units were not in a position to aid one another and he had no magic buffs to help out. The Blades killing the Omen in a single turn was the cherry on top, but I could have settled for holding him in place for a turn while the kraken did the dirty work. 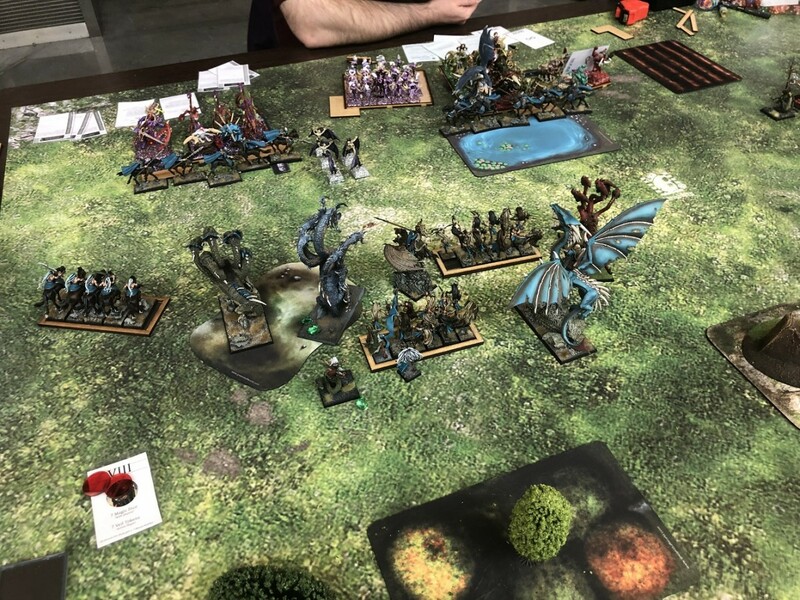 As we discussed after the game, keeping the Omen inside the Succubi would have made the latter a more difficult prey for the Kraken, and the Lemures a less juicy target for the Blades. 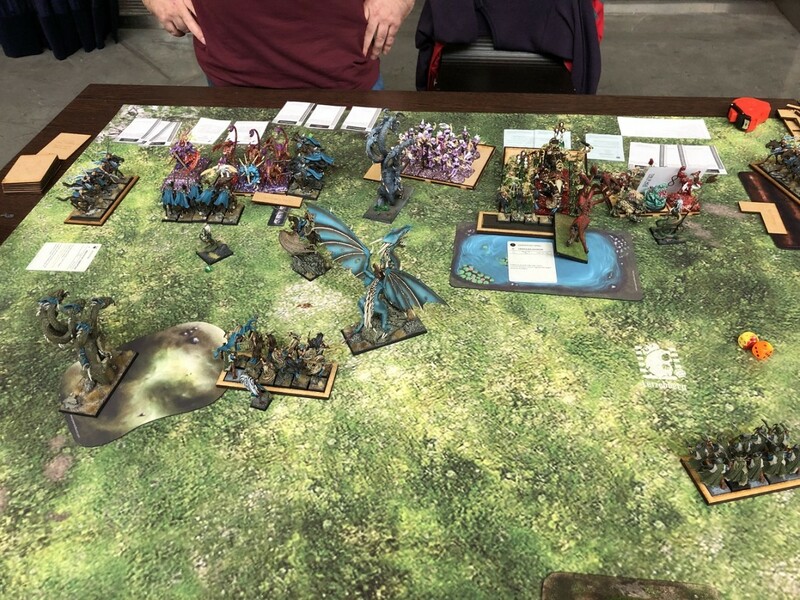 My teammates also did their job and we ended up winning this round 63-37 when our Highborn Elves snatched victory from the jaws of defeat against a very aggressive Ogre Khans army. With our second win of the day, we would go on to face a team from the Netherlands, team Hambo’s! The next game will be up over the next few days! Spiffing stuff as always, Mr Smith. Your hyper-aggro elves never fail to amuse! Lol blades killing the Omen.. It is actually within the realm of probability. When charging they strike before the Omen and they deal 5-6 wounds on average, without taking into account rerolls to wound. With Crippling Fatigue on, I'd expect to kill that Omen every time. It's one of these rare occasions where rank and file > characters, I guess! The sheer number of attacks with poison and rerolls also have a high chance of highrolling ofcours :). The horses and riders probably do about a wound, the fiends do about 1 back I'd say? (fiends probably have higher chance at more damage, but 1 each seems reasonable). Then it's flank and charge vs rank and banner. Equality. Even when the fiends do 1 more wound, it's not weird for the dark riders to hold that break test. It wouldn't be completely strange if the dark riders won the first round of combat, right? Exactly! In this case, the positioning of other units forced me to align in such a way that only one fiend was in base to base contact, hence winning the fight easily.